What do we know about the coming winter? There has been some speculation in the media today that we may be in for a long, bitterly cold winter because an El Niño is under way in the tropical Pacific. However it is still far too early to speculate about what sort of winter the UK will have. During an El Niño sea surface temperature in the east Pacific warms, altering weather patterns around the globe. The influence of an El Niño over the UK and western Europe tends to be weaker and less predictable than elsewhere because of how far away we are from the event itself. There is a link in late winter, when we can see a slightly higher risk of a colder than usual end to winter in El Niño years. 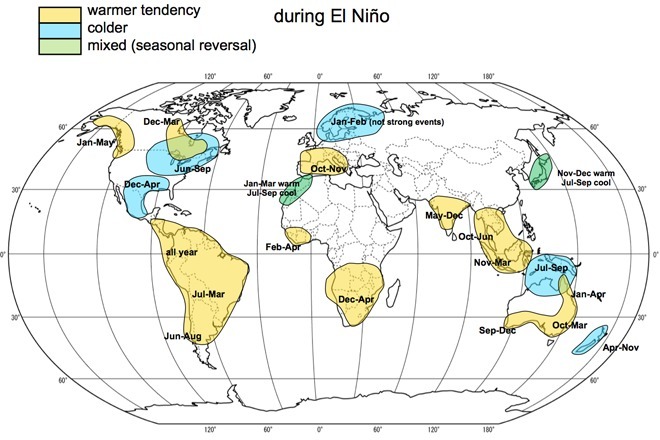 This map shows the effect El Nino has on temperatures around the globe. That’s not where it ends when looking at the UK winter, though. Other factors also have an influence, such as sea surface temperature in the North Atlantic, the Sun’s output, and changes in winds high in the atmosphere above the Equator known as the Quasi-Biennial Oscillation. These could wipe out the influence from El Niño, and all of them need to be taken into account to predict the winter. Our 30-day forecasts remain the best way for the public to get a long-range look at the weather we’ll see, while our detailed 5-day forecasts and warnings will keep everyone up-to-date for any periods of severe weather. This entry was posted in Met Office News and tagged Atlantic Multi-decadal Oscillation, climate, climate change, El Nino, heavy rain, Met Office, pacific, Pacific Decadal Oscillation, Quasi-Biennial Oscillation, rain, snow, wind, Winter. Bookmark the permalink. 16 Responses to What do we know about the coming winter? Interestingly your map shows the Eastern USA having warmer and colder tendencies. Does this mean it can alternate, do the two cancel each other out, or is it a mistake? They refer to different times of the year. As you can see from the map the warmer tendency is for the December to March period and the colder tendency is from June to September. Thanks very much. It was confusing due to the fact that the green of the overlapping area is a different green to the green areas on the rest of the map, and on the key. As you can see from the map the warmer tendency is for the December to March period and the colder tendency is from June to September. I compared ENSO and CET over recent winters and found no obvious relationship between the two when I looked a while back. The big driver for this winter maybe the persistent cold SST in the N Atlantic rather than any El Niño event that is occurring in the central Pacific. From my frame of reference, short term solar is responsible for negative NAO episodes, which then cause slower trade winds and hence El Nino conditions/episodes. Great the met office are predicting a colder winter – so I can safely put away the snow chains and snow shovel knowing it will be warm. The Met Office clarify the stories about winter. So it’s a case of we can’t tell you what’s going to happen this winter, but the same model can tell us exactly what’s going to happen in 2100. Have you rejected my comment of yesterday or is it still being moderated? Mention of James Madden in the Express and Mirror (he says the same every single year). No mention of man-caused climate change denier Piers Corbyn though. That map suggests no cold risk assuming a strong Nino. So why was the MO quoted in the Mail saying a cold winter is possible? Your media guys need some training to get the message across and that includes what not to say. I am wondering why the impact of El nino is limited in only a few areas? What will happen in China, mideast and Africa? Is there no significant change, or unknown results? The coloured areas on the map show where there is a substantial chance that El Nino will have the impact indicated. For example, for a warm tendency there is roughly double the chance or more that seasonal temperatures will be in the top one third of those observed through past decades. Several of the areas not coloured are also affected by El Nino, but the chances are lower.